For a recent project, I’ve been researching organizations and values within organizations. For many years now, I have heard people speak about value and values disjointedly, as though the singular, value, and the plural, values, are alienated from one another. Value arises in conversations about economics, finance, shopping, investment, business, and markets. People worry about getting value for their money or shareholder value or market value. They use value to describe business or economic prospects. Value connotes a pointed estimation of current or anticipated worth never too distant from monetary equivalence. There is no value that is not a dollar value. The plural values, meanwhile, crops up when people talk about beliefs and behaviors regarding how human beings do or do not get along with one another and with gods, spirits, and nature. Values are nouns, but nouns concerned with verbs of attitude and action. Values sort into several categories. People refer to social values and political values; and, to family and religious, and environmental values. Values are estimations not of worth but of worthwhileness. Unlike value, talk of values ignores money; it opines on timeless appraisals instead of transient ones. There is a deep, backward-and-forward-looking quality to values. If value is what makes us wealthy, values, we assume and regularly assert, are what makes us human. I purchased Smith’s book because this, to me, seems like the defining issue of our times: the erasure of values in a monomaniacal pursuit of value. I’d never heard of Douglas K. Smith. The paperback version of his book doesn’t have a single review on Amazon. Hard cover copies of this book can be had for a penny. I couldn’t even find the book directly through a shortened Amazon search for “On Value and Values”. I write this because in Smith’s book I feel like I found a Dutch masterpiece underneath an old garage sale purchased painting. I have only one concern about “On Value and Values” – that the author is not a famous celebrity. Because if he were, the book would be a #1 bestseller and its ideas and prescriptions would already be guiding us toward a saner future together. Douglas K. Smith should be up there with Capitalism and Freedom (Friedman). On Value and Values is comparable to Democracy in America and What’s the Matter with Kansas? 1. Smith identifies the problem in a way that speaks to everyone: value trumps values. The split occurred with the rise of market fundamentalism and excessive focus on shareholder value at the expense of all other values. Values? Yes, they matter – as long as the benefits to shareholder value outweigh the costs to shareholder value. In this scheme, values are split off from and subordinated to value. Is it any wonder that people opine for the loss of values in our society? I’m with them. The trouble is that values are being erased or de-prioritized in favor of returns. And we’re sold that somehow this is going to lead to a greater good all by itself. 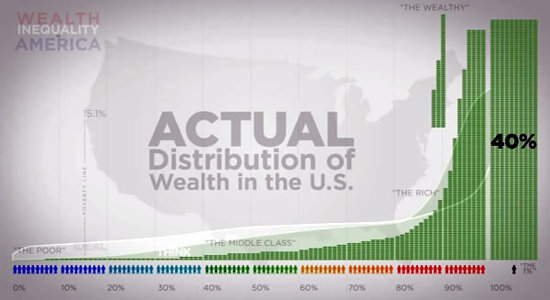 Only the only thing it’s leading to is the hoarding of capital. The interesting thing is that Smith makes the case from a business perspective. He is no “socialist”. He is a former McKinsey consultant who has worked in more than 40 industries. What does capital want? More capital. For what? What purpose? We are, in a sense, working for capital. Capital is not working for us. 2. Smith lays out the challenge we face. Our challenge is to reintegrate values and value. Employees who intuitively grasp the indignity of being assets also understand that companies are not run exclusively for the benefit of those who do the work. Our challenge is to reintegrate value and values, not to choose sides in a destructive either/or battle between opposite sequences leading to a single answer. We cannot restore value to its place as one among many values by reversing the unethical logic of The Balanced Scorecard. And, perpetuating a dogma making values a means to the end of value is unsustainable. Value must operate as one of many values-all of which are both means and ends to and from one another. It is not to hold values over value. This is just as problematic and is the issue we encountered with modernity when some single group championed their “values” over all others. This is not what Smith argues for at all but rather an integration of value and values. 3. Most importantly, Smith lays out a vision for a different kind of capitalism. As liberals, we tend to be good at deconstructing media. We see racism and sexism and forms of discrimination. We are good at pointing out problems. These are all good things. We are also good at specific policy recommendations. Where we often stumble is constructing a vision of something better. In the absence of a vision, our vision is defined as “socialism”. This is important because I don’t believe socialism is the answer. At the same time, market fundamentalism is destroying our planet. How do we bring in the businessmen? I don’t see businesses or businessmen or women as enemies. I think, by and large, we share most of the same values and should be working alongside each other. One way to do this is to talk about how to integrate value and values in businesses. It’s to say I understand your problems, and to lay out a better vision for markets. We are not natural enemies. We are natural allies. Friedman laid out the case for individualism with Capitalism and Freedom. On Value and Values is the first book I’ve seen that does this for capitalism and caring. This is not a “3rd way” book. It does not shrink from the problem and try to triangulate a solution. 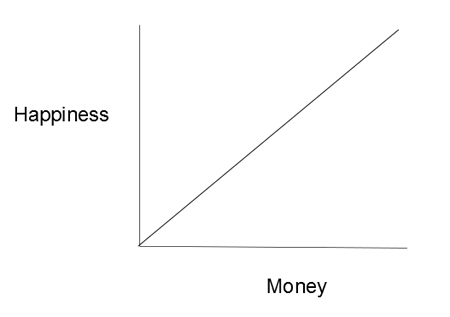 This is how I think an economy for everyone could work. This is real change. Not the cosmetic political nonsense we’re used to. It is, so far as I’ve seen, one of the few and certainly the best book on the subject. Values are as necessary for capitalism as value. Without an integration of value and values, capitalism is unsustainable. 5. Why is this important? This is a conversation you can have with anyone. Business people. Religious people. Liberals. Conservatives. Anyone. The beauty of it is that values is the topic conservatives often bring up. You can use this as a segue. Have you ever talked to someone about an issue and it just seemed the person didn’t “get it”? In all likelihood, what the person was doing was reasoning from within a system where value is the only thing that matters. Now we could call this person stupid. It’s far more likely, however, that the person is “reasoning” about ROI and personal returns. Just as you are “reasoning” from other values. One way to expand the conversation is to talk about values. What’s important? What are we working towards? What are our values? What I’ve found is that values unite us. That is, we tend to have a lot in common. Beliefs, or things we think are true, tend to divide us. It is much easier to have a productive conversation about beliefs if you start from what the values you have in common. If you can establish that you’re both working honestly from similar values, then you are both on the same side working towards common goals. In this manner, you’re far more likely to find solutions. At the very least, people understand why you’re saying what you’re saying. You are not evil incarnate. And this alone, believe it or not, is big. Many, many people have laid out the challenges with capitalism. What most fail to do is articulate a convincing alternative vision and discuss how to make this possible. In other words, it’s not going to change until enough people act. Smith talks about how people can do this in their organizations. He talks about how to articulate clear, compelling “should be” values in organizations. He focuses on how to win people over with examples and a better vision. He understands that politicians are not the start of change. Politicians are the end of change. Politicians will fight for change when enough people and organizations advocate for change. This is not to say politicians aren’t important. It’s to say that politicians are only capable of enacting certain amounts of incremental change. If we want substantial change, we have to change things on the ground and in our organizations. In other words, he lays out both a long term game plan and identifies some simple steps people can take within their organizations. This has happened. Mid-level social formations grounded in place have atomized. Structures that once made sense – local government, neighborhood, community – destabilized. Individuals began bowling alone in markets. An extreme cult of individualism took hold. Powerful shared ideas promoted collectivities of I’s and nostalgic, but imaginary, places as the social formations linking us together. But neither succeeds because neither binds us with inescapable shared fates. Small town and neighborhood are shared ideas disconnected from actual shared lives. Smith believes that organizations are the new way we share shared fates outside of our friends and families. He advocates for action within organizations with the biggest action being to integrate values into how things are done. One of my favorite and perhaps the most intriguing is to establish a 3rd legislative house for lobbyists. The idea is to take lobbying out of the shadows and reintroduce shared public concern. And yes, I understand this is unlikely to happen. What I like about Smith’s ideas though is that he openly acknowledges what everyone knows in a manner that speaks to business people and he specifically lays out some interesting ways we could deal with them. Included interests and concerns of employees in annual reports. Jury trials in organizations (trials by peers for wrongdoing). Creating efficient capital markets for non-profits. It’s interesting to hear how some of these might play out and the impact they could have. The question I hear most often is, what can I do to make a difference? 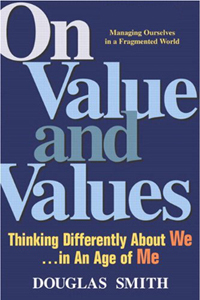 On Value and Values may be the best book out there on this subject. I believe it is comparable to Lakoff’s Don’t Think of an Elephant and will likely return to this book again and again. 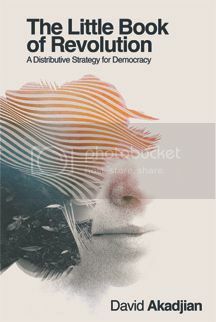 This book is the wisest, most real and pragmatic description of values – including what’s at stake and what you can do about it – that exists in print or any other medium. I don’t consider this hyperbole.